The opening selection on Slackers in Paradise: Slack and Steel Guitar Duets conjures up the bliss of kicking back on a hammock near surf-washed sands, caressed and refreshed by island trade winds. 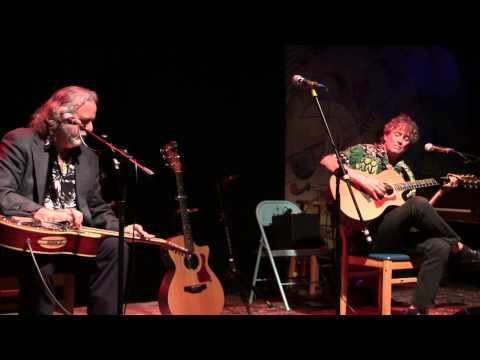 The recently-released CD by Jim “Kimo” West and Ken Emerson ushers you into an unhurried world free of traffic jams and family frenzy. With West on slack-key guitar and Emerson on acoustic steel guitar, the slow pieces are dreamy and tantalizing while even the fast-paced numbers evoke a time when life seemed simpler. Slackers is the first recorded collaboration by the two string masters. West, who has spent much of his adulthood in rural Hana, Maui, is acclaimed on the mainland and in Hawai’i for his artful use of open-string tunings that are the heart of traditional slack key. Dubbed “Kimo” by Hawaiian friends, he has also created original tunings to enrich his interpretations and compositions. Playing at music festivals, concert venues, and coffeehouses, West is based in Los Angeles when not touring for his other major gig – lead guitarist for musical satirist Weird Al Yankovic. Kenton Robert Lopaka Emerson was born in Hawai'i but spent most of his childhood in the San Francisco area. There he learned to fingerpick 1960s folk and blues hits on the guitar and ‘ukulele. When his family relocated to Hawai'i in 1968, he quickly tuned into the culture, studying Hawaiian language, listening to vintage recordings of Hawaiian music, and becoming a proficient slack key as well as steel guitar player. Emerson has played alongside such Hawaiian Cultural Renaissance luminaries as Gabby Pahinui, Raymond Kane, and Moe Keale. Currently he divides his time between Kaua’i and the Bay Area. Both Emerson and West are represented in Grammy-winning recordings of current slack key masters produced several years ago. Both have performed in the prestigious Southern California Slack Key Festival and are featured in the 2017 slack key bonanza. To hear the pair perform duets from the Slackers CD live at a jewel of a venue, mark your calendars for December 9, the date of the annual Holiday Slack Key Show that West originated at Alva’s Showroom, in San Pedro. 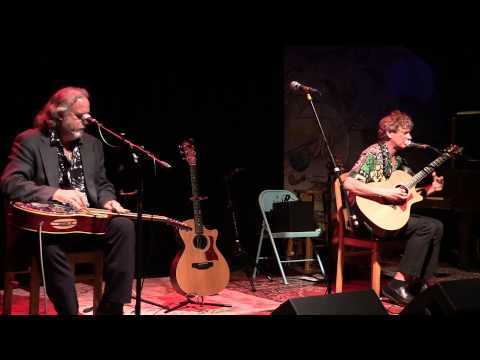 In Slackers in Paradise, the two musicians principally combine slack key with acoustic steel guitar. However, both are multi-instrumentalists. Thus we hear West on baritone acoustic guitar, other acoustic guitars, ‘ukulele, electric bass, and percussion. Emerson plays not only his National Tricone acoustic steel guitar, but also other acoustic guitars, soprano ‘ukulele, and dobra. Of the sixteen selections on the disk, six were composed by Emerson and five by West. In Aokealoa (Cut 3), Hamakua Hale (Cut 14), and Mahia (Cut 15), Emerson paints moods with lush, arpeggiated sequences rather than unified melodies. Pentatonic, blues-infused, and jazz-influenced passages reflect a thoughtful, exploratory style. However, in the Wairoa Ukulele Rag (Cut 11), he spins a captivating melody, deftly nailing the genre. Me A’u Lei also shows a more traditional tonal structure and leaves ample room for stellar steel guitar embellishments. Ka Nani O Serra de Estrella demonstrates artful use of Spanish melodic and rhythmic idioms. In contrast, West’s compositions all have strong melodic structures with tunes and variations that tell stories in music. Slackers in Paradise (Cut 1) and Mango Season (Cut 6) suggest the tropical fantasy of slowing down to smell the plumeria. The rollicking Slack Key Polka and tongue-in-cheek Silent Movie Slack Key with its melodramatic recurring diminished chord progressions are particularly entertaining. His Nu’uanu Waltz evokes to me the aching romanticism of the final years of Hawaiian royalty that so emulated elite European culture. Four pieces by other composers -- Hawaiian, Hapa Haole (having an Anglo-American elements), and rock (Ruby Tuesday by Jagger/Richards) – show the pair’s ability to create fresh interpretations in diverse genres. No doubt the two will have a blast playing the Holiday Slack Key Show with Jim “Kimo” West and Ken Emerson at Boulevard Music in Culver City on Saturday, December 3rd at 8:00pm and at Alva’s Showroom in San Pedro on Friday, December 9 at 8:00pm.and at the Coffee Gallery Backstage on Saturday, December 10 at 8:00pm. Expect duets and solos from the headliners plus “surprises,” as West told me. Adding sparkle to the evening are vocals by Diana Tanaka and hula performances by Amanda Taketa and Kevin Tsutsui plus more Hawaiian traditional dancing by keiki (children). There will be Christmas melodies, to be sure, but with a Hawaiian flavor. For those who OD early on holiday tunes, I find that even among Hawaiian-style holiday recordings, West's instrumentals remain for me the freshest. Ki Ho’alu Christmastime with Jim Kimo West and Kimo’s Hawaiian Slack Key Christmas should be available for purchase at the show along with Slackers in Paradise: Slack and Steel Guitar Duets. Having passed the five-year mark, the show at Alva’s has become a tradition , attracting fans from outside as well as within the L.A. area and quickly filling the 80-seat venue. Reserve tickets by calling Alva’s Music at 310-833-7538 . By the way, Alva’s Music Store, adjacent to the performance space is definitely worth a music-lover’s visit. Wishing FolkWorks readers a slacker’s holiday season, this FolkWorks writer is nearly done for 2016. My last column of the year is still in the elves’ workshop. Audrey Coleman is a writer, educator, and ethnomusicologist who explores traditional and world music developments in Southern California and beyond.